Plenty of room for your family vacation in this comfortable beach house. 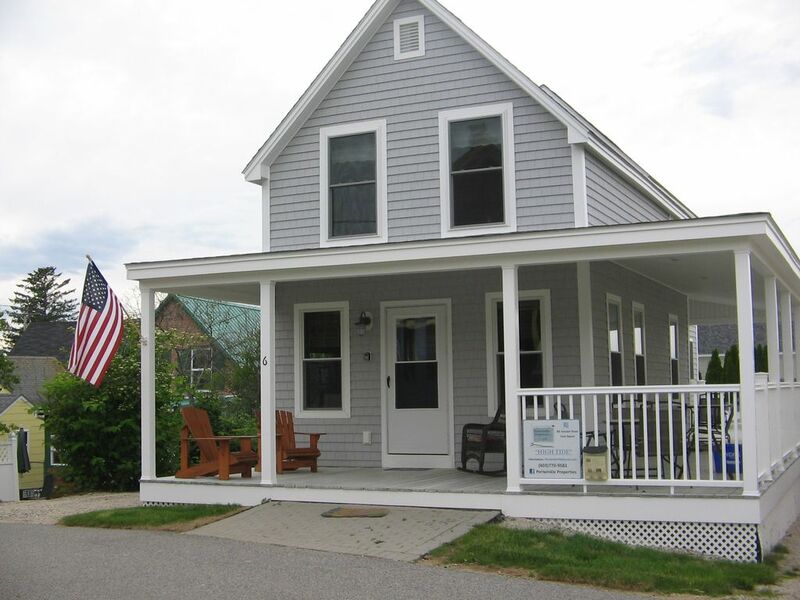 The spacious, four bedroom house with a large wrap around porch is the perfect destination for a York Beach trip. Its casual living space has everything you need while you are enjoying the beach, shopping or sight seeing any time of year. There are sleeping accommodations for 11, including a first floor bedroom and bath for those who prefer minimal stairs. Well behaved dogs are welcome to join you in your stay and parking is available for 3-4 cars. Other Periwinkle Property listings on VRBO are 418399, 418442 and 680980 and are located next to this house. We live just over the border in New Hampshire but love to play at York Beach. We formed Periwinkle Properties LLC when we purchased a collection of three houses in the spring of 2012 and added one more in January 2015 right next door. Periwinkle combines our interest in fixing up older houses with time at the beach. 'Hidden Treasure', 'Breakwater', 'High Tide' and 'Windswept' are all part of Periwinkle and available for rent individually or as a package. See the listing numbers above. This house was renovated top to bottom in the winter of 2013. It is comfortable any time of year and is within walking distance to the Nubble Light House and Short Sands beach. Both bathroom have showers only. Sheets and towels are available, nothing fancy but functional. Wrap around porch with tables and seating. We were in town with our 3 adult children for a wedding. We found the house very comfortable, clean and well appointed. Beautiful location just around the corner from spectacular ocean views. A great family cottage. Everything you need for a comfortable week. High Tide is a great cottage that comfortably sleeps my entire family. It is a quick walk to short sands beach and it has a huge wrap around porch that we eat on every day. There are beautiful ocean breezes all day long. We love staying at High Tide. It was our second year and we will be back! Anita and Don French are terrific people and truly care about the comfort of their guests. The home we stayed in was clean and comfortable. We would not hesitate to stay again! We have rented this property for the past several years with our family and we love it. It is a great location and pet friendly. Close to short sands and the shops. Kittery outlets are within a few miles and always enjoy our stay in York. Fabulous and clean! Great location and everything you need (sheets / kitchen necessities ) are provided .... a huge plus! Anita and Don are wonderful and easy to communicate with. It’s a very organized process and would highly recommend renting any of their properties. This was our second year renting High Tide and we enjoyed it just as much as the first time!